There are several examples of tire rim grills out there, but this is one of the more elegant versions. And what’s great is that it is also one of the easiest DIY projects you can find. You can definitely make this for yourself regardless of your skill level! This DIY grill is made out of only one tire rim and it does not require any welding. It’s all about simply putting 4×4’s, a steel pipe and the tire rim together! It also comes with wheels, making it very convenient and easy to use. You can put in a fine wire mesh, a thin steel sheet or an old frying pan as your ash pan. The most important thing to remember here however is to clean the tire rim thoroughly, especially by sandblasting. And as with any new grill, do an initial burn before cooking with it. 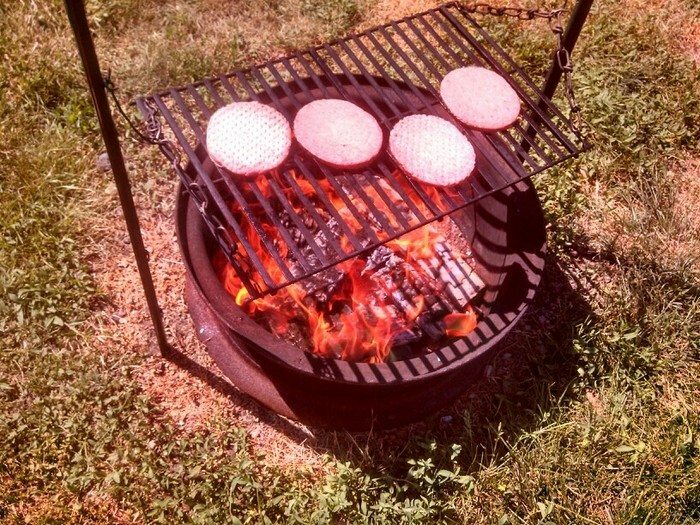 If you want to have an awesome tire rim grill but don’t know how to weld yet, here’s the right DIY project for you! Here are some other versions for your inspiration! The most frustrating step: Removing the rim from the rubber was by far the most frustrating step. After watching several videos and trying to pry the two pieces apart I actually ended up using a reciprocating saw with a metal cutting blade to cut the bead from the tire and then pried the rim out with a threaded rod and large screwdriver. After freeing the rim I took it to a local shot blasting facility where they let me blast it myself. It took about 11 minutes and cost under $20 ($30 if the facility did it themselves). Parts and painting: All the parts I found at my local Home Depot. The black pipe I had cut and threaded there. The pipe flange that will be mounted to the wood base needed no further attention as it would be taking the appropriate 1/2″ lag bolts. The flange that will secure the rim to the pipe needed its holes drilled larger to accommodate the wider 5/8″ wide head bolts. Next is the painting. I used Rustoleum High Heat paint which is specifically for grills. It goes on just like any other spray paint (if anything it goes on smoother). I applied two coats to the parts and hardware. I pressed paper towel strips into the bearings of the wheels before painting to ensure they wouldn’t get clogged. The base: Tire rims are fairly heavy so the base had to be fairly heavy also. I wanted to match or exceed the weight while not making the base too large so I settled on using 4×4’s. I cut the 4×4 with a miter saw so that the base would be square. Next I drilled holes through the ends using a guide hole I drilled in a piece of scrap wood. Ideally I would have used a drill press for this step as the holes would have been perfectly the same in each piece of wood but since I didn’t have one I planed and sanded the whole base after sliding the threaded rods through the holes. Previous articleStormtrooper log burner from gas bottles! And what happens when the ash falls down on wooden plate? You can put in a fine wire mesh, a thin steel sheet or an old frying pan as your ash pan. Very nicely done!!! Good job!!! One thing I’d add is id seal the bottom of rim with sheet metal or make a tray that could be emptied when full of ash. First I LOVE this design!! But, I wondered if coals would drop the holes of the rim onto the wood below and be a fire hazard or did I miss a step?